Very cold and occasionally foggy at first then mild and mostly sunny. It was very cold in my cabin during the night and I woke a few times wishing I was tucked up in my tent in my sleeping bag. Determined to try and reach the trail finish at the Hovell Tree, 49km away in Albury, in daylight, I left the cabin in the pre-dawn at 6:30am and set out at a good pace with light provided by a fabulous moonset across Lake Hume. The early trail passed through the Ten Chain Stock Reserve, presumably part of the national system of stock routes in rural Australia. As usual, the early walking hours seemed the best. There was fog drifting in some of the nearby valleys and frost in some of the pastures, as the sun rose in clear skies and cold temperatures. On the radio, they said the temperature in Albury was 0°C and it felt like it. But as the morning wore on it became warmer and I gradually removed layers to end up in the usual shorts and T-shirt. After the Stock Route, the balance of the morning was spent roadwalking, some of it in thick fog, through the rural outskirts of Albury. It was easy to make good time on the roads and I passed lots of interesting farmlets and some nice views, but it is hard on the feet. By the time I reached the suburb of Thurgoona in early afternoon, where the trail began following footpaths and bike trails, I was just plodding along, hanging out for the next break. The trail-marking was hard to follow in places, and I began to rely on the maps and GPS to confirm I was going the right way. Suburban walking doesn't have a lot to recommend it, and I was looking forward to the climb of East Hill in Albury for a change of terrain and pace. All day, I had tried to cover at least 10km between breaks and to keep the breaks short and was happy to see I was on schedule as I approached East Hill and the final 10km. The climb up the Hill on the foot trail was very welcome to my road-pummelled feet, and at the top I was rewarded by some excellent views into Victoria, along the Murray River, and way back from where I had hiked. After a walk along the ridge of East Hill I made a painful descent into central Albury and the final sole-destroying and soul-destroying couple of kilometres across the town. The sun was setting and it was a race to get to the Hovell Tree in daylight. I made it at 5:25pm in just enough light to take a few photographs, and then sat on a park bench for 15 minutes or so to recover and ponder on my journey, as night fell and the air cooled. 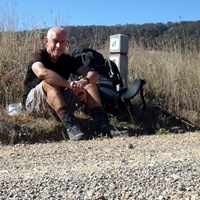 The trail had matched my expectations with its great mix of rural and mountain Australian scenery, but I was surprised not to have met a single hiker the whole way, travelling in either direction. Maybe it's the distance from the Australian population centres, but perhaps it just isn't well enough known. It's a pity, because it's a great slice of Australia. The camping facilities and guidebooks were excellent and I look forward to running some of the trail in the Hume & Hovell 100km in October. I will be back. I finally roused myself from the park bench and hobbled the half kilometre to my motel. After a shower, I wandered downtown and bought some dinner to bring back to the motel, and am looking forward to stretching out in my window seat on the train tomorrow and looking at the mountains I have just traversed in the distance to the east.